Hi and Welcome to Red Couch Recipes and to my Family Heirloom Table. I inherited this set of China from my mother and father. 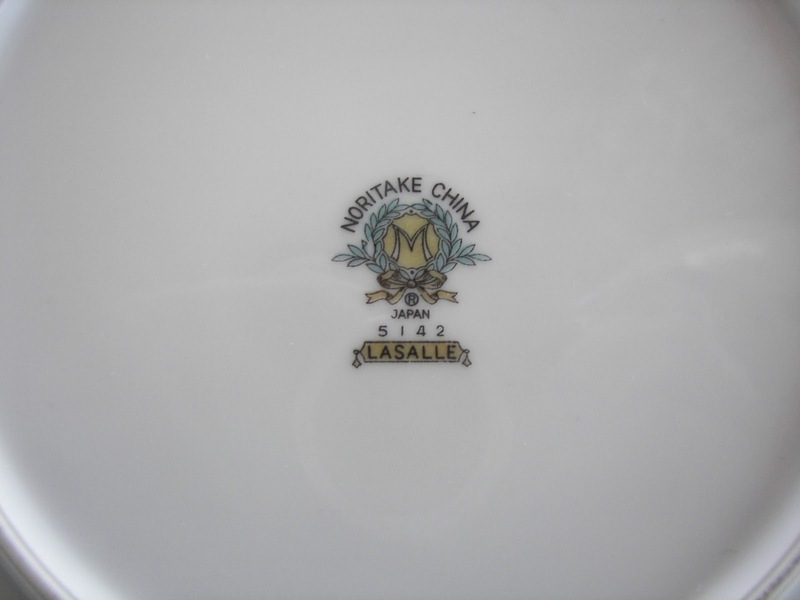 It is the LaSalle pattern manufactured by the Noritake China Company. Because the China is marked with an M, for Morimura Brothers, it was made in 1950, 1951, or 1952. The LaSalle pattern was made from 1950 - 1955. My mother's brother bought the set for her when he was overseas for military service. The centerpieces are large cream ceramic pieces. I am hosting the young women from our church tonight where we will learn about setting a table. I sure wish some of you tablescapers could be present tonight! I am more of a casual kind of girl! 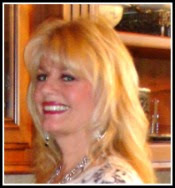 They are coming tonight at 7 pm MST -- any ideas for "must tells" for the girls? Let me know in the comments. Here's my bubble glass view. One of the things that I am going to tell the girls is that when you are looking for a centerpiece, just grab things around your home! The ceramic pieces and the "family sign" are things in my living room and kitchen. Also shown more visibly below are the little mini-suitcases. 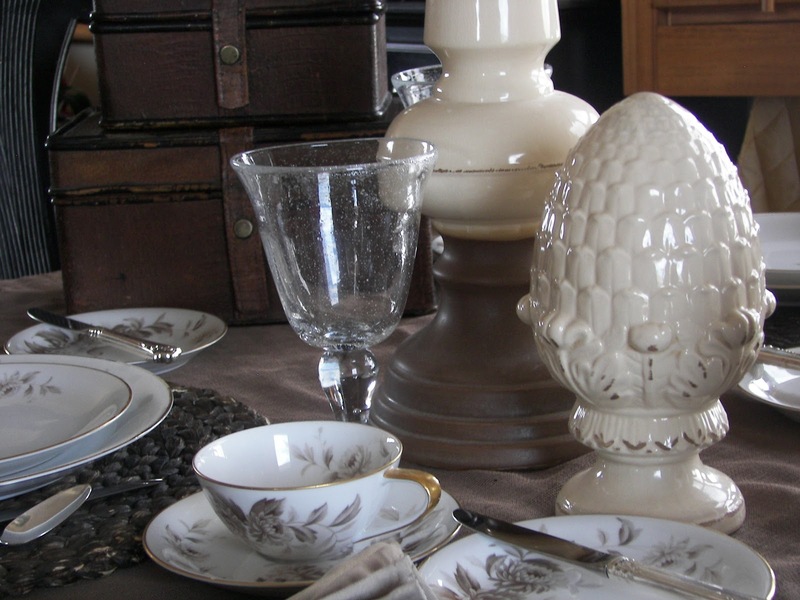 To me, they symbolize antiques or vintage items such as this china set. The tablecloth is actually a large curtain that some day I am planning to hang. We are not coffee or tea drinkers, but I wanted to show the girls the proper placement of the cup and saucer. 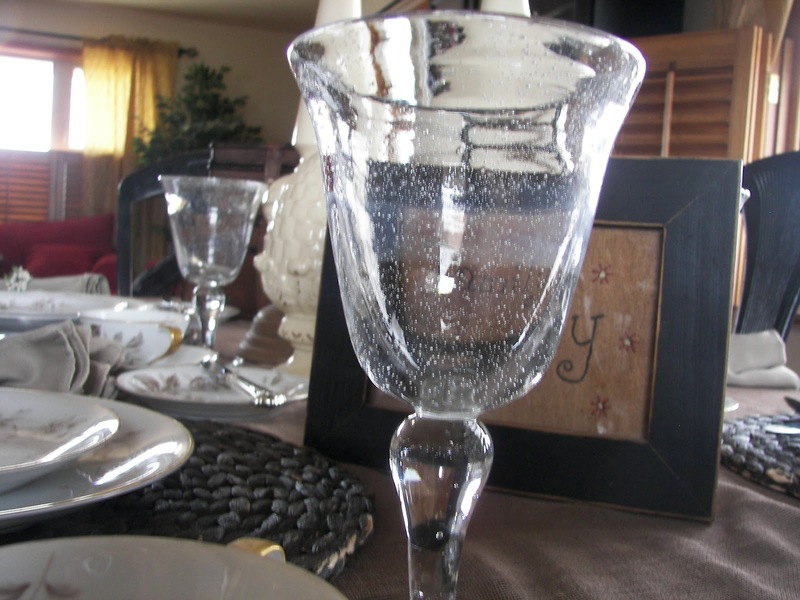 Most likely we would have a cherry hot chocolate served in these beautiful cups. I love the gold handle. For dessert, I am serving them brownie pops and milk using my snack sets -- not very formal, huh? These are teenage girls! 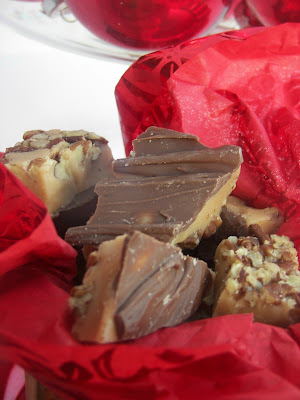 Thanks for stopping by Red Couch Recipes. 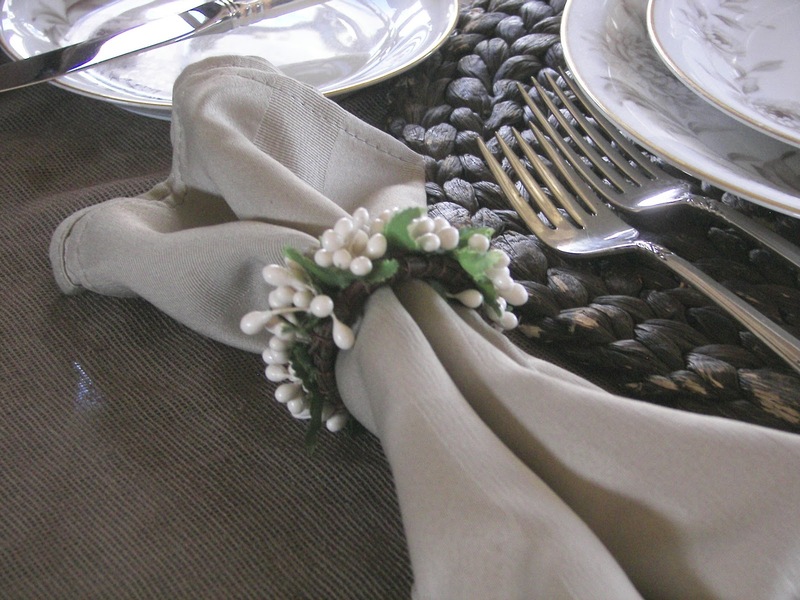 Be sure to drop by Tablescape Thursday at Between Naps on the Porch where you will be inspired! What a wonderful table. There is nothing better than heirlooms. And those Noritake patterns from the 50's are really nice. Isn't is amazing how this china has held up???!!! It looks great. Beautiful pattern on this china. I love the colors you have used with it. Have fun! I love your china Joni. The beauty of it is that it was your parents, I adore whatever it is from our both families, mine and hubby's. Your table is gorgeous, so elegant and warm. The cup and saucer makes me want to have tea, right now! I'd love for you to visit me and see one of my mom's oldest china I did a table with. Beautiful patterned china...I like the gray shades, almost like a black and white photo. It makes it really special that it has been in the family for years. 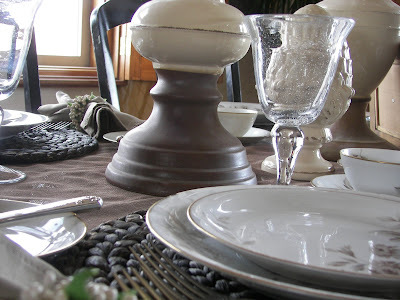 How fun to be giving teenaged girls a class on setting a table...it is almost a lost art with kids these days. very pretty table.. and now I'm going to investigate those brownie pops! Your china is elegant! It's great that you are sharing your knowledge and your love with the girls from church. You'll do a great job and have lots of fun. I think you can tell from my tablescapes that we are pretty casual too. I like to have fun with my tablescapes although I do love the rare "elegant" ones that I do. I love your china. Is that black or brown? It is so pretty and still so stylish today. I think the table looks perfect. What wonderful elegant china. I love the neutral color. I think it could easily lend itself to being a bit more casual, depending what you pair it with. LUcky young women. My girls loved having etiquette dinners and learning some manners along with the table settings. Amazing to me what some of the younger generation don't know about a formal table. Everything is so laid back that I think it's good to have a formal evening for them. You are so fortunate to have such an heirloom to pass along - and to have the story of how it came to your mother. 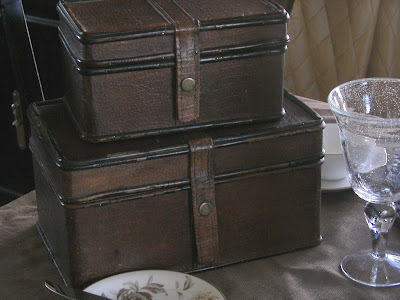 Beautiful inherited pieces! You set a stunning table as always. Such a lovely table Joni. 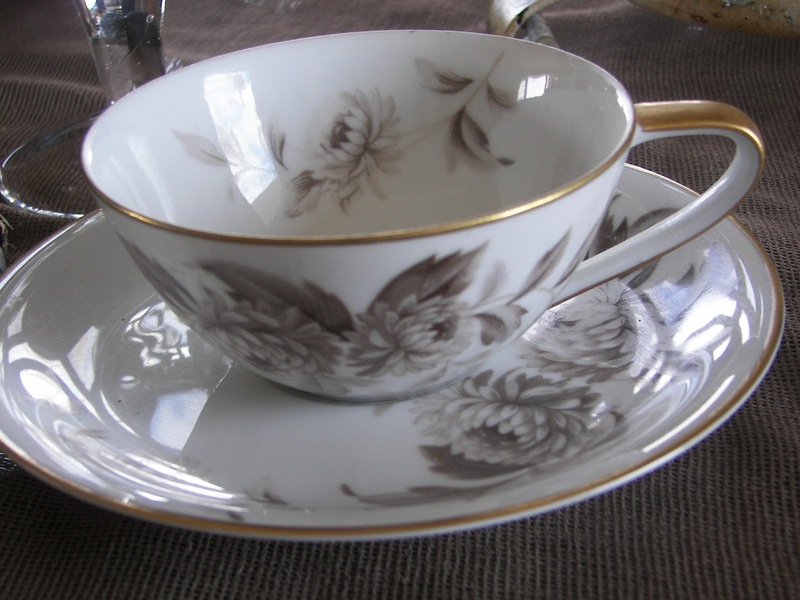 The Noritake is gorgeous. Joni, the table looks fantastic. Made me start thinking about my grandmother's China that was passed to my mom, then my sister and now my neice has it. I didn't like it when I was younger but now I wish I had it. 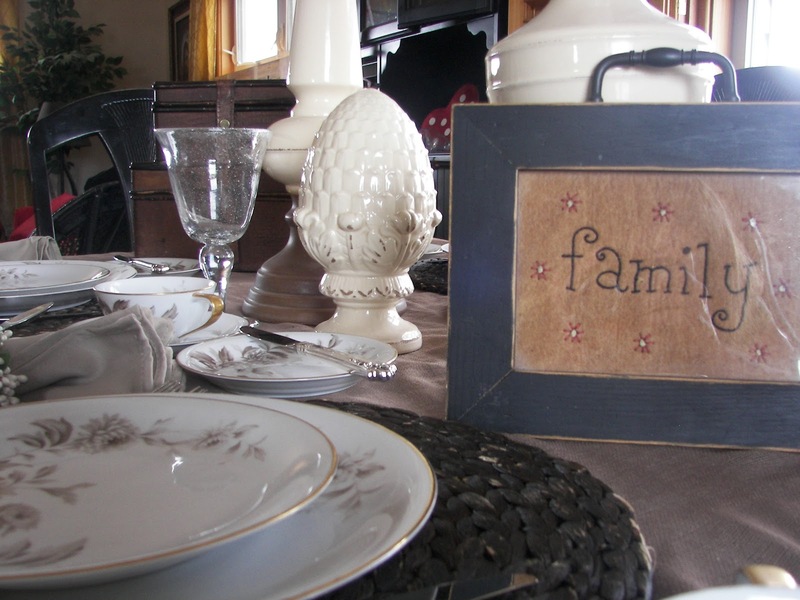 Family, and family traditions is what life is all about. What a beautiful and treasured set. It' so wonderful that you know the history. The lines on those cups are wonderful.. would be great to for a cup of broth! Hope the evening with the girls went splendidly. Lovely table and great pieces to decorate with. I love your china heirloom, and you know the story. I totally adore family treasure, it's the better part of life. I love the lines on the cups, just great. Hope you have a great evening with the girls. I love all your lovelies. Hope you visit, I have heirlooms too. I'm at BNOPT. Your table is beautiful, Joni. You are so very lucky to have a set of china that belonged to your mother. 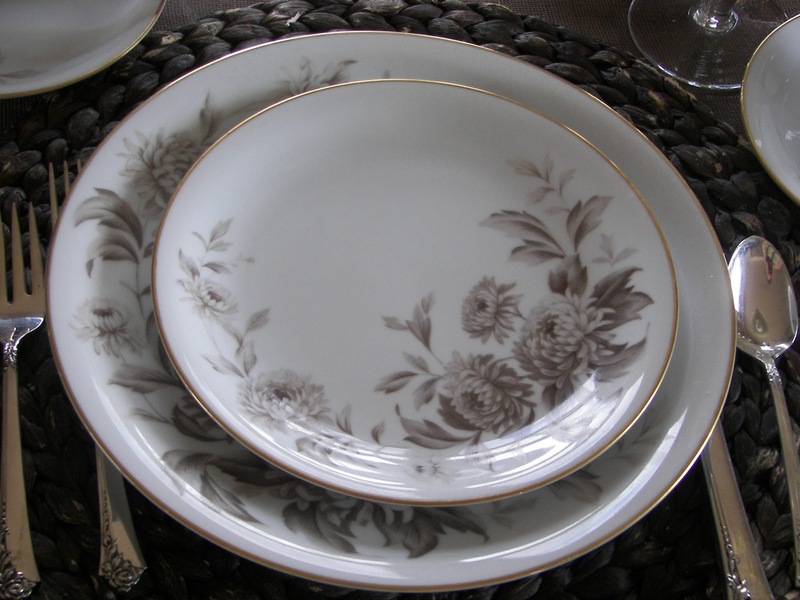 I love the gold ring around the edge of the plates and the lovely spray of flowers across the bottom. You have a real knack for combining other items with your very special china. Beautiful table for so many reasons. Just plain pretty for one, colors go perfectly, a brother getting china for his sister, it all being passed to you, and those lucky girls to learn from someone so talented. 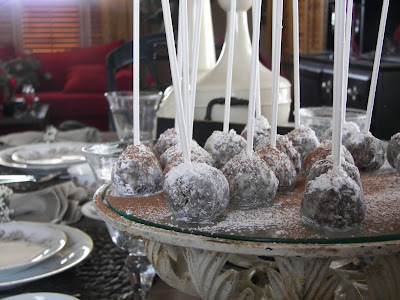 I'm sure it was a great evening...oh yeah, and those brownie pops!! !